Click image to enlarge Field, Fifth Plain Creek at NE88th Street, looking northeast, Clark County, Washington. Image taken September 2, 2018. 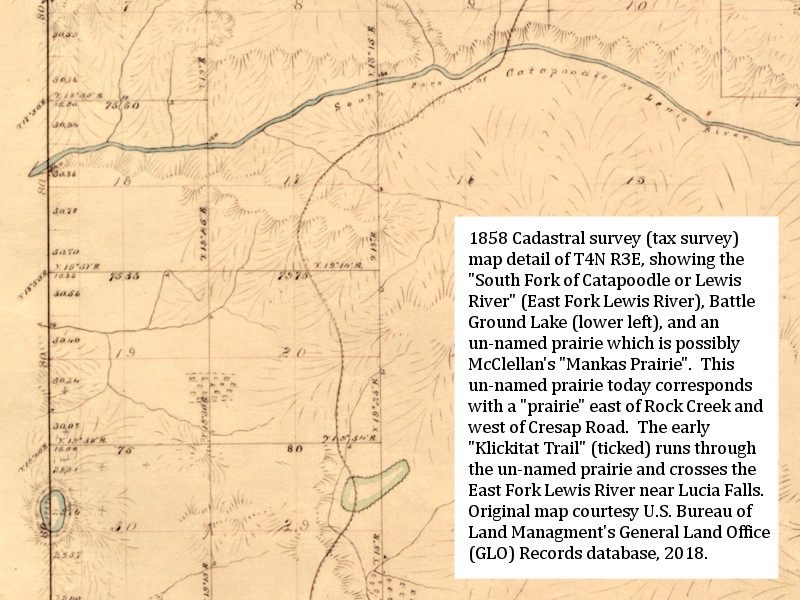 These plains and prairies were first mapped between 1853 and 1855 by Pacific Railroad surveyors Captain George McClellan (1853) and James G. Cooper (1854, 1855). 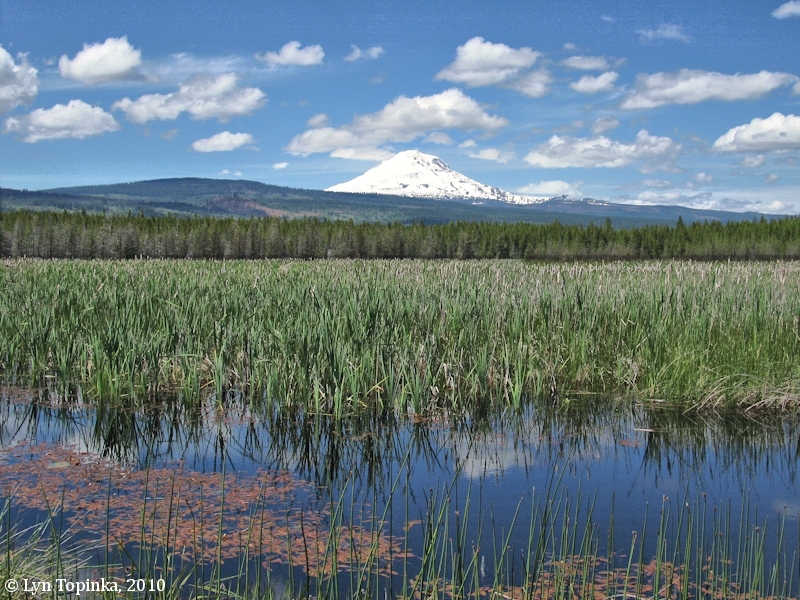 Norton, Boyd, and Hunn (1999) list five "vegetation zones" (described by Jerry Franklin and C.T. 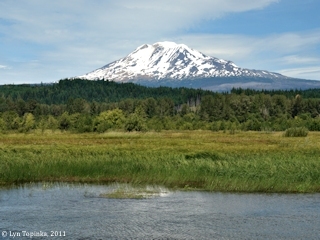 Dyrness, "Natural Vegetation of Oregon and Washington", originally published 1973, republished 1899 by Oregon State University Press) and related campsites as described in the journals of James G. Cooper (1853 and 1855) and George McClellan (1853). Descriptions from Cooper and McClellan. 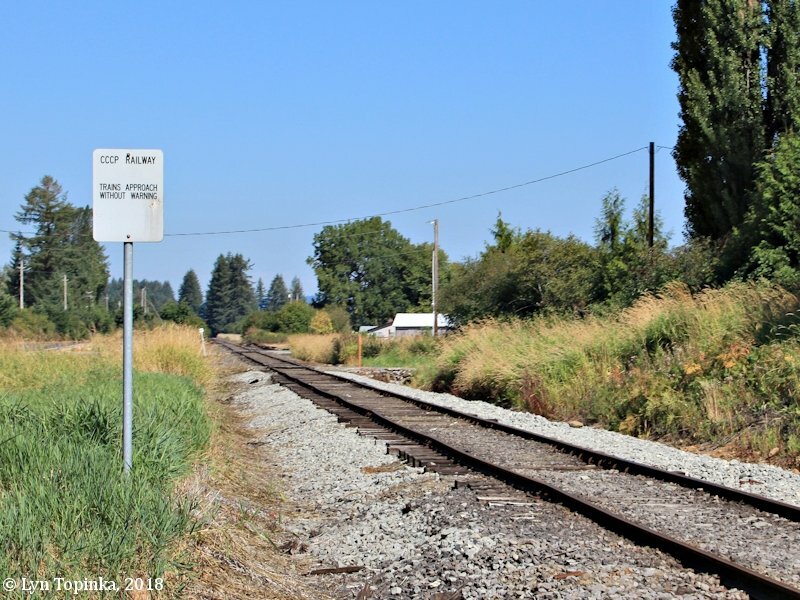 Dates, distances (in miles from Vancouver) and site spellings are by Minter. Elevations (in meters) are approximated from USGS maps. 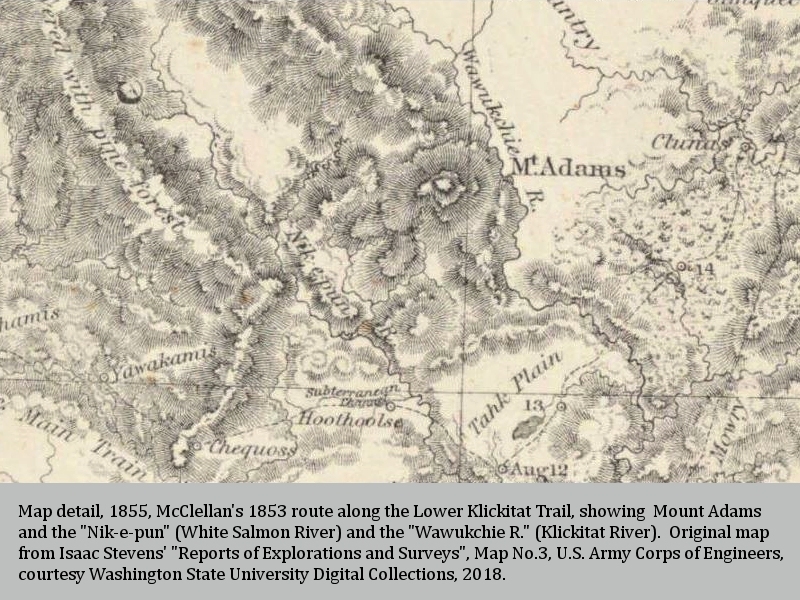 From "General Report of Captain George B. McClellan, Corps of Engineers, U.S.A., in Command of the Western Division", February 25, 1854, IN: U.S. War Department, 1855, "Reports of explorations and surveys: to ascertain the most practicable and economical route for a railroad from the Mississippi River to the Pacific Ocean, Volume 1", Joseph Henry and Spencer Fullerton Baird, U.S. Army Corps of Engineers, A.O.P. Nicholson, Printer. "Sir: I have the honor to submit the following report of the expedition under my command. ... I will endeavor to make this report as brief and general as possible, referring to the accompnaying documents for details. The topography of the country will be found in Liet. Duncan's map and memoir. Mr. Minter's itinerary will show the obstacles met with on the march, daily distances, ec. For the meteorology and barometric profiles, I refer to Lieut. Mowry's reports and drawings. Mr. Gibb's reports give the geology of the country and everything rlating to the Indians. The natural history and hygiene of the country are discussed in Dr. Cooper's reports." 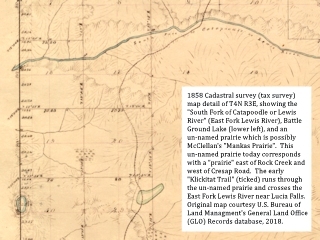 "Topographical Report of Lieutenant J.K. Duncan, U.S.A., Topographer of the Western Division", February 21, 1854, IN: U.S. War Department, 1855, "Reports of explorations and surveys: to ascertain the most practicable and economical route for a railroad from the Mississippi River to the Pacific Ocean, Volume 1", Joseph Henry and Spencer Fullerton Baird, U.S. Army Corps of Engineers, A.O.P. Nicholson, Printer. 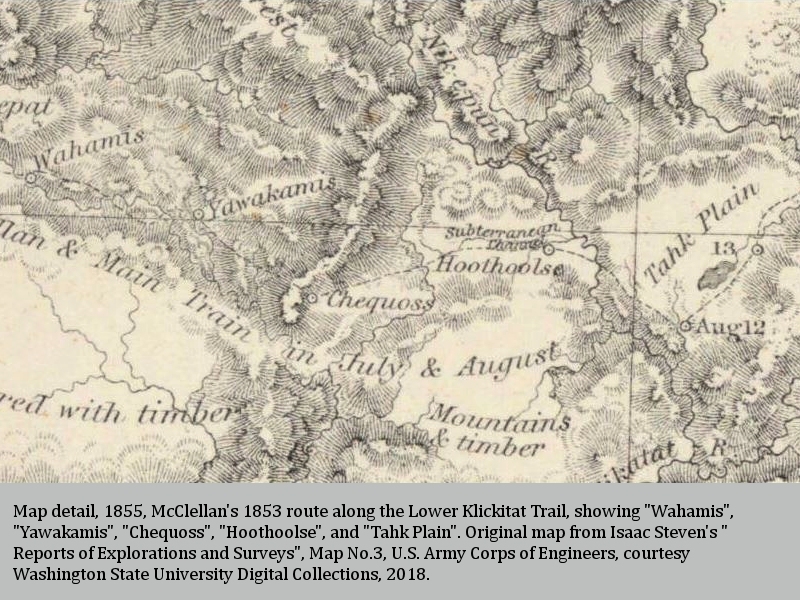 "Sir: I have the honor to submit, together with an accompnaying map, the following report on the topography and general character of the country along the route pursued by the party under your command in an explorarion of the Cascade mountains, during th emonths of July, August, September, October, and November, 1853, viz:"
From "Itinerary of Captain Mc'Clellan's Route; Prepared by J.F. Minter, Olympia, Washington Territory", February 25, 1854, IN: U.S. War Department, 1855, "Reports of explorations and surveys: to ascertain the most practicable and economical route for a railroad from the Mississippi River to the Pacific Ocean, Volume 1", Joseph Henry and Spencer Fullerton Baird, U.S. Army Corps of Engineers, A.O.P. Nicholson, Printer. 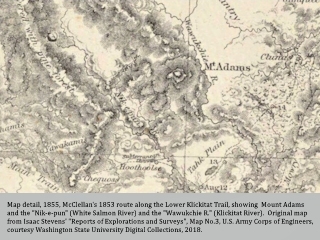 "Sir: I have the honor to submit the following ininerary of the route pursued by the party under your command, in an exploration of the Cascade mountains, during the months of July, August, September, October, and November, 1853. Second and Third Plains (Pahpoopahpoo and Heowheow). 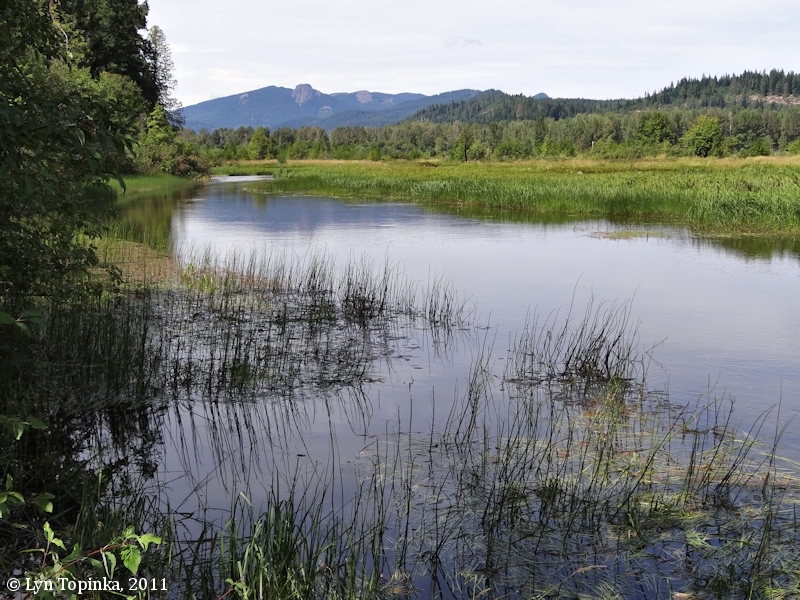 Mesache Camp ("bad", Chinook Jargon). Lakas (or Lacash) ("kinnikinnick place") Camp. Wahamis (Susuk) Camp (Two-by-Four Prairie?). Hoolho-ose (Wilwilchelis) (at or near Trout Lake, "kingfisher's"). 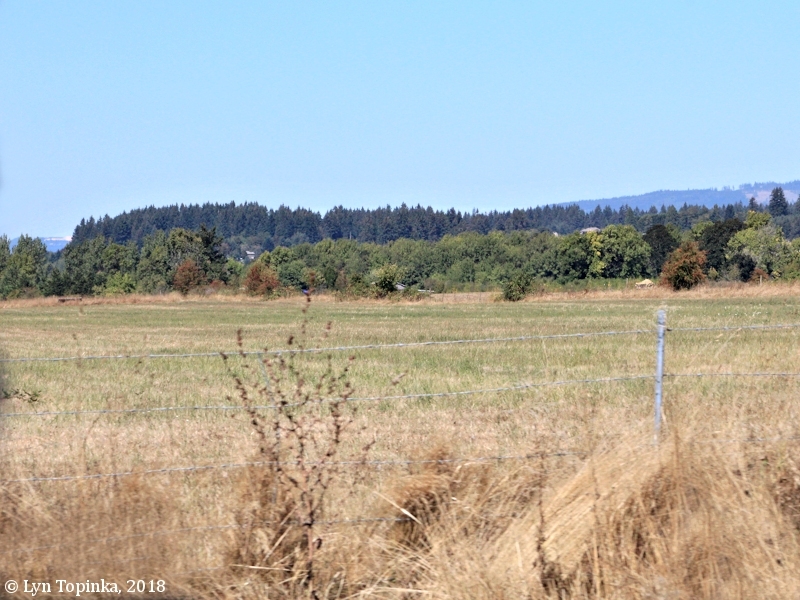 Tahk ("vernal meadow") Prairie (near modern Glenwood). July 18, 1853. 61 meters, 2.25 miles from Vancouver. July 21, 1853. 70 meters, 7.25 miles from Vancouver. July 22, 1853. 79 meters, 13.25 miles from Vancouver. "Kolsas Plain", "Simsik", "Mankas", and "Yahkotl". Click image to enlarge First Plain ... Eleanor Roosevelt Elementary School, Vancouver, Washington. Once the location of "First Plain" and the Bagley Downs Racetrack. 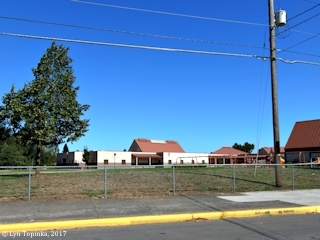 Image taken August 24, 2017. Click image to enlarge Fourth Plain ... Mural, Fourth Plain, Orchards, Washington. 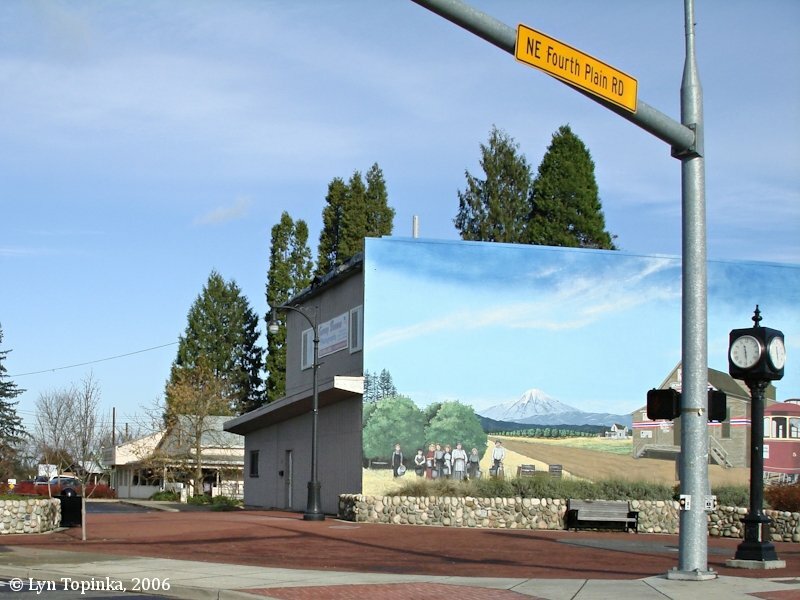 Image taken November 25, 2006. 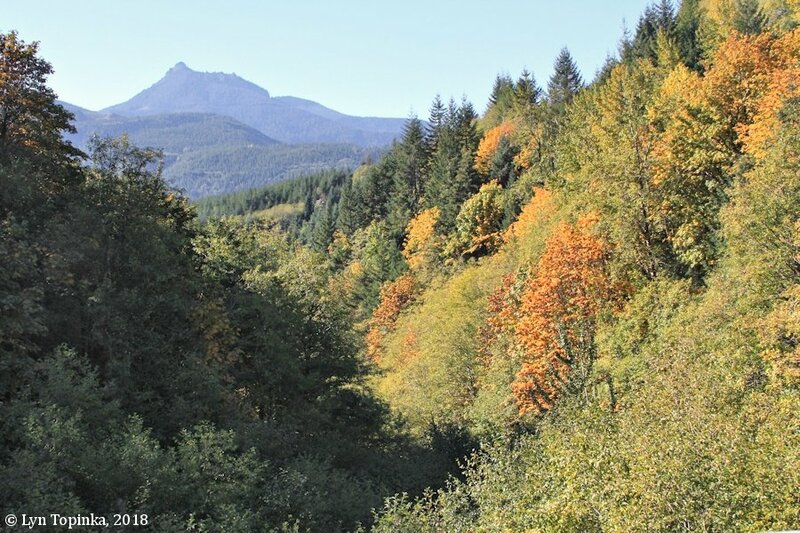 Click image to enlarge Fifth Plain ... Fifth Plain Creek looking upstream, Clark County, Washington. 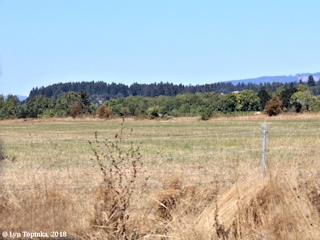 Where Fourth Plain Road crosses Fifth Plain Creek, view from moving car looking north. Image taken May 3, 2017. July 23, 1853. 183 meters, 19.75 miles from Vancouver. July 24, 1853. 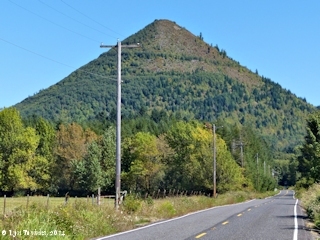 198 meters, 25.75 miles from Vancouver. July 25, 1853. 198 meters elevation. 35.25 miles from Vancouver. July 31, 1853. 180 meters elevation. 41 miles from Vancouver. August 1, 1853. 137 meters elevation. 51 miles from Vancouver. "Yahkotl", "Chalacha", "Spilyeh", "Lakas", "Noomptnamie", "Wininepat", "Wahamis". 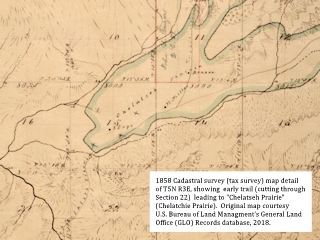 Click image to enlarge Mankas Prairie ... Cadastral survey (tax survey) map detail, 1858, for T4N R3E, showing the early trail (ticked path) and what is possibly the Mankas Prairie. 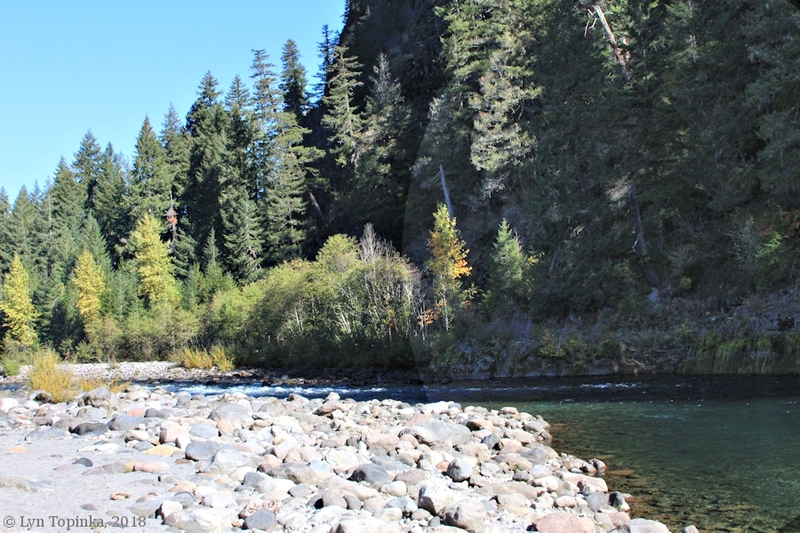 Map also shows the "South Fork of Catapoodle or Lewis River" (today's East Fork Lewis River) and Battle Ground Lake (lower left). 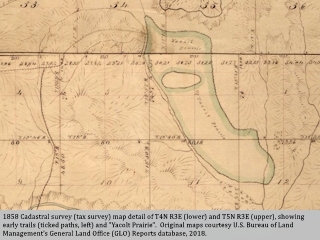 Original map courtesy U.S. Bureau of Land Management's General Land Office (GLO) Records database, 2018. 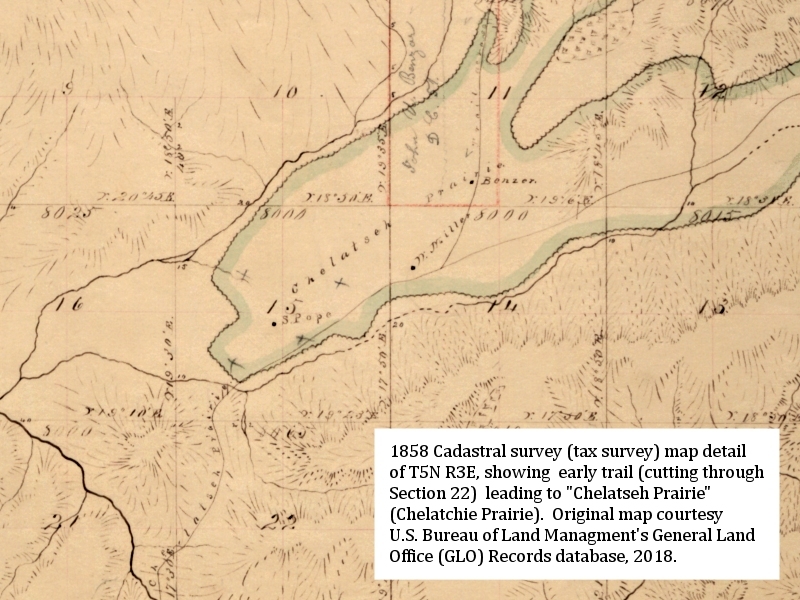 Click image to enlarge Yahkohtl Prairie ... Cadastral survey (tax survey) map detail, 1858, for T4N R3E (lower) and T5N R3E (upper), showing early trails (ticked path, left) and Yacolt Prairie. 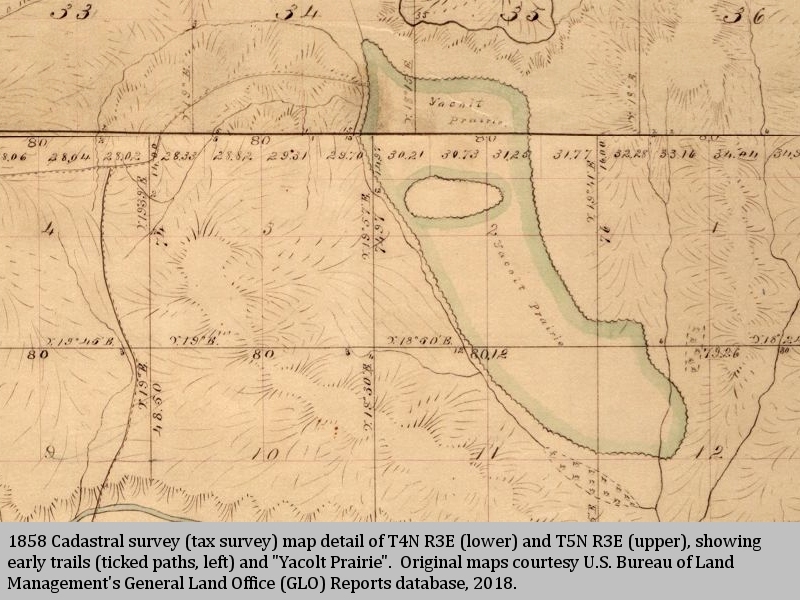 Original map courtesy U.S. Bureau of Land Management's General Land Office (GLO) Records database, 2018. 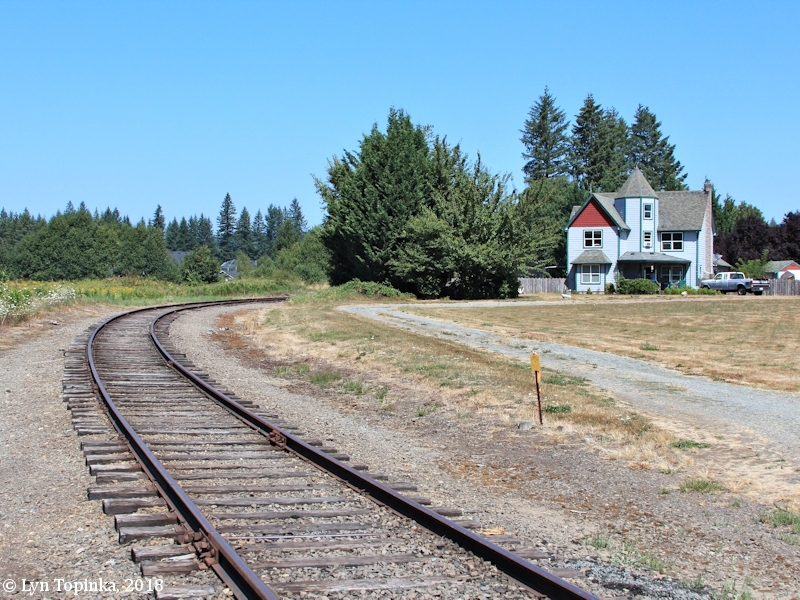 Click image to enlarge Railroad tracks at the south end of Yacolt Prairie, heading north to Yacolt, Washington. Image taken August 29, 2018. 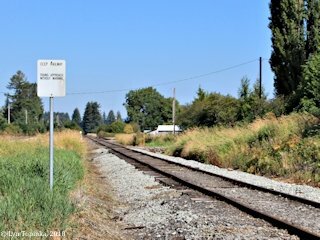 Click image to enlarge Railroad tracks, heading north out of Yacolt, heading to Chelatchie Prairie, Washington. 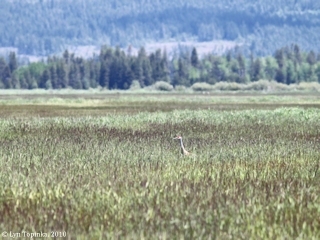 Image taken August 8, 2018. August 2, 1853. 152 meters elevation. 57.5 miles from Vancouver. August 3, 1853. 305 meters elevation. 65.5 miles from Vancouver. August 6, 1853. 1037 meters elevation. 88 miles from Vancouver. August 8, 1853. 1189 meters elevation. 93.75 miles from Vancouver. "Wahamis", "Yawakamis", "Chequoss", "Hoothoolse", "Tahk Plain". August 11, 1853. 579 meters elevation. 105.75 miles from Vancouver. August 12, 1853. 549 meters elevation. 114.25 miles from Vancouver. 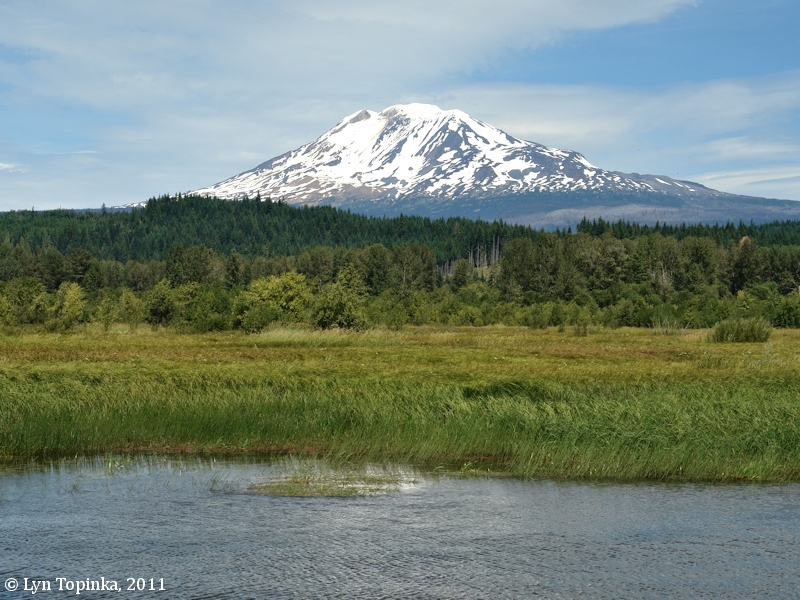 Mount Adams, the "Nik-e-pun" (White Salmon River), and the "Wawukchie R." (Klickitat River). 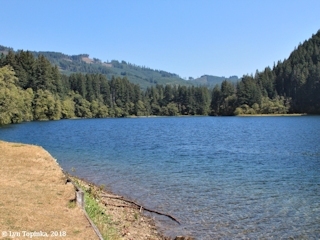 Click image to enlarge Trout Lake looking west, Washington. Image taken August 22, 2011. 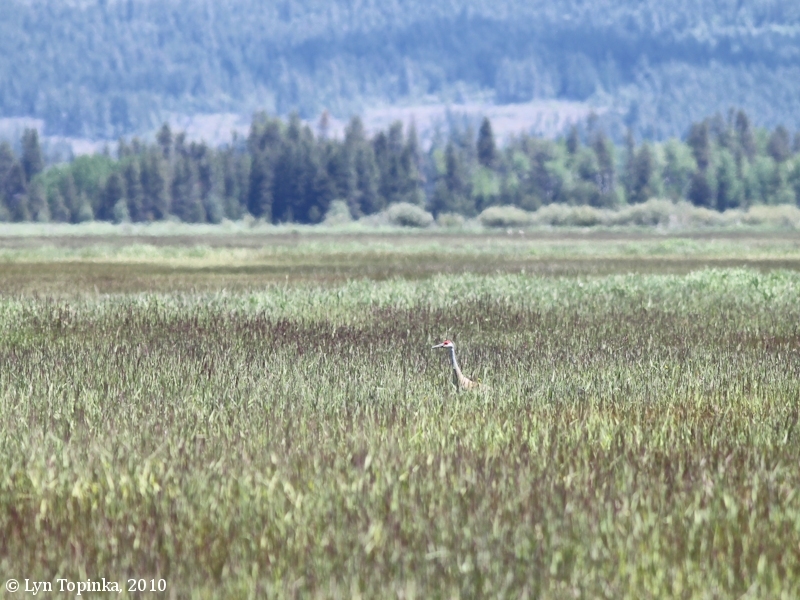 Click image to enlarge Sandhill Crane in field, Conboy Lake NWR, Washington. Image taken June 5, 2010. 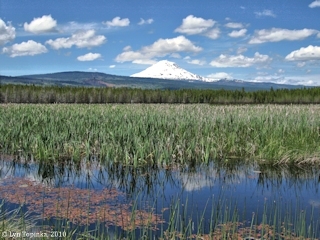 Click image to enlarge Conboy Lake and Mount Adams, Conboy Lake NWR, Washington. 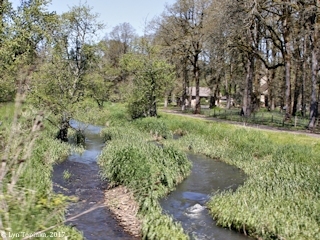 Image taken June 5, 2010. 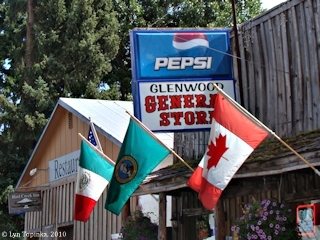 Click image to enlarge Glenwood, Washington. Image taken August 11, 2010. 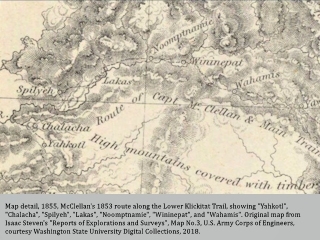 "Like the Chinook tribes, the Klikitat Indians and other interior peoples accessed the Columbia River, but in contrast to the lower Columbia River tribes' shoreline orientation, the Klikitat traveled north and south along the tribuatires between the south-central Cascades and the Columbia River. 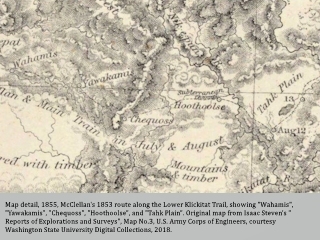 The Klikitats' subsistence strategy was "prairie-oriented," moving with the seasons to take advantage of plant resources ripening at different elevations. 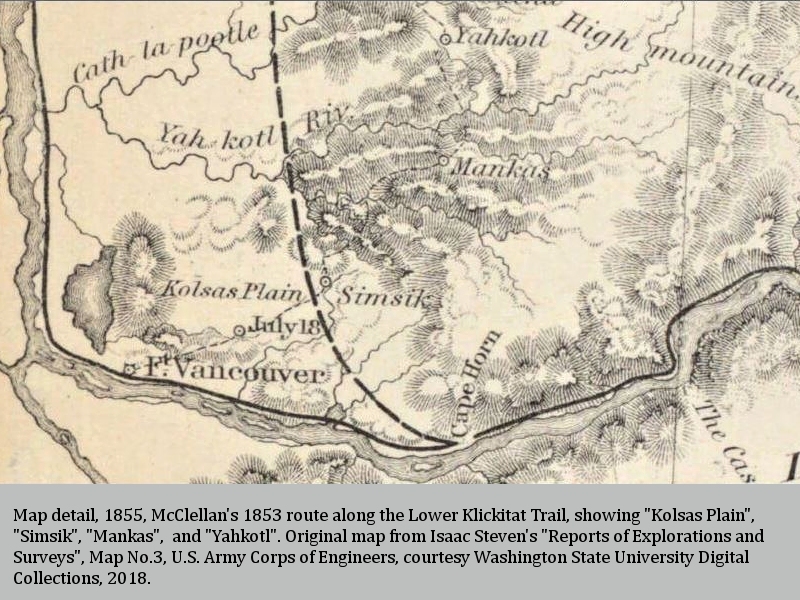 The Klickitat Trail, an overland route from Fort Vancouver to The Dalles and Yakima, was a network of trails and prairies that connected the Klikitats' subsistence areas, and enabled the tribes to take advantage of trans-Cascade trade. ... 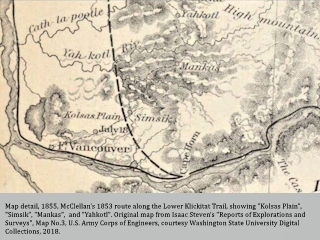 The Klickitat Trail ended approximately in the vicinity of the current Vancouver National Historic Reserve, although the exact terminus is unknown. 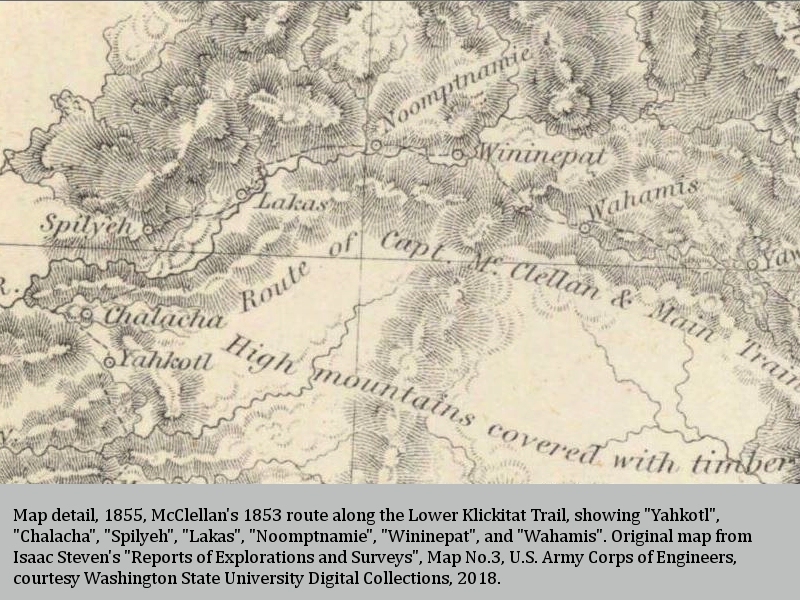 The lower Klickitat Trail prairies mapped by McClellan and Cooper were called Alack-ae ("turtle place"), Wahwaikee ("acorn"), Pahpoopahpoo ("burrowing owls"), Heowheow, Kolsas, and Simsik by the Indians according to J.F. Minter's records. Hudson's Bay Company settlers re-named these prairies "Fort Plain", "First Plain", "Second Plain", "Third Plain", "Fourth Plain", and "Fifth Plain", respectively. 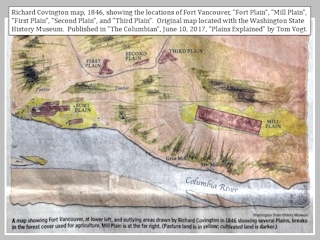 Cooper noted that First Plain through Fifth Plain were covered with good grass for horses, and eight edible berry species; ..."
Source: Vancouver National Historic Reserve Cultural Landscape Report, October 2005, Produced by Jones & Jones Architects and Landscape Architects, Ltd., Seattle, Washington, for the National Park Service, U.S. Department of the Interior.